That's My Pan!® is thrilled to introduce our brand new Designer Artist Series personalized cake pans and lids. The aluminum Christmas cake tin lids are coated on both sides with a durable bright white coating that forms the canvas for our Christmas Socks design, custom designed by a local artist, and perfect for bringing along to those Christmas gatherings. 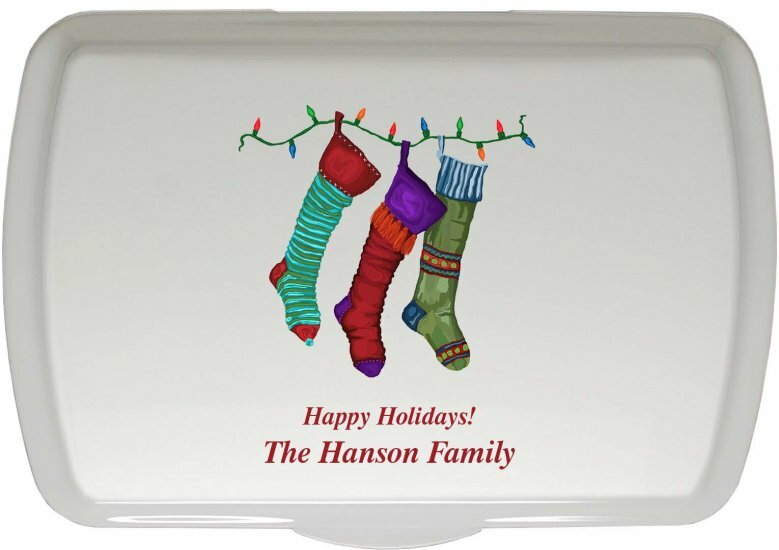 In addition to the custom Christmas Socks artwork on the lid, you're allowed to personalize both the lid and the pan! Our Designer Artist Series Christmas baking tin lids can be paired with our Traditional, Doughmakers®, Bar Pan, or Non-Stick pans. 9x13" traditional bar pan with a custom Christmas Socks design lid. 9x13" non-stick Christmas baking tray with custom Christmas Socks design lid. Contact us to learn about this Christmas stocking cake pan. 9x13" traditional cake pan with a custom Christmas Socks design. Custom Christmas Socks design lid. These only work with our 9x13" Traditional, 9x13" Non Stick, 9x13" Bar Pan or 9x13" Doughmakers® Pans.